First, in general, when it comes to whether an equilateral triangle is also an isosceles triangle, a square is a rhombus, and so on, it is very important to realize that the decision to include or rule-out one type of figure can be a purely human convention—that is, it is often a human decision rather than one based upon the structure of mathematics. 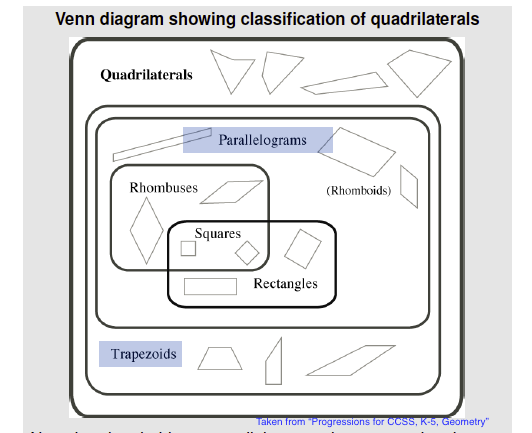 Thus it is common to see some books include parallelograms as trapezoids (at least one pair) and others rule-out parallelograms as trapezoids (exactly one pair). (1) To make categorizing figures easy to learn for students. In Eureka Math, it was decided that all relationships between figures should be defined by inclusion instead of relating some figures by inclusion while defining other figures by rule-out. Thus, a parallelogram is also a trapezoid, an equilateral triangle is also an isosceles triangle, a square is also a rhombus and a rectangle, and so on. This conscious choice to make figures always related by inclusion rather than some inclusion and some rule-outs is a very important one for students. It means that learning which figures are also other figures always follows the same principle—students don’t have to learn a bunch of “special cases.” This makes categorizing figures enormously easier, more intuitive, and overall far more coherent than the old common understandings—students only have to remember one principle and apply it appropriately. (2) To make the definitions consistent with how they are used in all future math courses. For example, calculus uses “trapezoidal approximations” for calculating integrals. This method (and its explanation) only makes sense if rectangles are also trapezoids. Since rectangles are also parallelograms by inclusion, then parallelograms should be trapezoids by inclusion as well. (3) To make theorems and proofs more general. The use of relating figures by inclusion serves a mathematical purpose: If you prove an idea that holds for a rectangle, then it automatically holds for a square. Similarly, if you prove something about the parallel sides of a trapezoid, then you automatically prove it for both pairs of parallel sides of a parallelogram. The fact that you get “extra facts for free” is a mathematical reason for relating figures by inclusion. This “two birds with one stone” aspect helps students appreciate and learn the importance of precisely defined definitions, and to reason with those definitions. It should be pointed out that the reason for the “old common understanding” may have had a lot more to do with testing than it did mathematics. States and assessment agencies liked using the notion that some figures were related by inclusion while other figures were related by rule-out because of the high p-scores they could get on such questions on high stakes exams. Basically, the state could ask a “math” question that could distinguish between students who memorized all the special cases versus those who didn’t. These questions are not really fair to ask since they are manufactured to be memorization questions that have little to do with mathematical structure. When the Progressions document, “Progressions for the Common Core State Standards in Mathematics (draft). Grades K-5, Geometry,” correctly suggested in the diagram on page 18 (see below) that parallelograms should also be trapezoids, Eureka Math agreed and did the same. You may want to subscribe to my YouTube channel because it has videos that explain why math make sense (like this article). This entry was posted in Engineering School Mathematics and tagged A Story of Units, Category, Classification, EngageNY Curriculum, Eureka Math Curriculum, Figures, Geometry, Great Minds, Scott Baldridge. Bookmark the permalink. 8 Responses to Why should a parallelogram also be a trapezoid? The answer may surprise you. I agree with the inclusion definition. It does however bring up an issue with the isosceles trapezoid. What is the definition? If it is a trapezoid (at least one pair of parallel sides) with the other sides congruent, then isn’t a parallelogram an isosceles trapezoid? If so, then then the property of congruent diagonals does not work for ALL isosceles trapezoids? An isosceles trapezoid is a trapezoid with at least one line of symmetry. Careful, I said an isosceles trapezoid is a *trapezoid* with a line of symmetry. Does that work for you? I see…But what is a trapezoid? 🙂 If parallelograms can be trapezoids, than a rhombus would fit your definition. Yes, right. Should have read ONE line of symmetry. Sorry! Or something about opposite sides. My first thought is to see if an inclusive definition makes sense and adopt that definition as long as the debated objects satisfy all of the important characteristics and theorems of the larger category. As a result, I am very happy to treat squares as rectangles, rhombuses, and parallelograms; circles as being ellipses; and equilateral triangles as being isosceles. However, I have not been able to become comfortable with the inclusive definition of trapezoids, with parallelograms being regarded as trapezoids. Trapezoids do not have nearly as many important theorems applying to them as is the case for many other geometric figures, so we need to be very careful to hold those fewer properties and theorems in high regard. One important subset of trapezoids involves isosceles trapezoids. If parallelograms are regarded as trapezoids, then it seems they would need to be isosceles trapezoids, but such does not seem to align with the intent of isosceles trapezoids. Even more importantly to me, there is an important theorem pertaining to trapezoids that does not apply to parallelograms. In particular, if given the lengths of the four sides of a trapezoid traversing sequentially around the trapezoid, if such a trapezoid exists, all such trapezoids are congruent up to orientation (and there are generally two distinct orientations, though only one for isosceles trapezoids); also, all such trapezoids enclose the same area, regardless of orientation. This is not so for parallelograms–there is an infinity of non-congruent parallelograms whose sides have a specified length, with enclosed area ranging from 0 to the area of the rectangle, with the area in any particular case being based on the angle at a vertex of the parallelogram. Trapezoids of given side length have no flexibility with respect to the angles at the vertices.